"22 degrees!" Bill called out, as though a temperature rise of 1 degree was the best news of the night. His headlight beam cast a streaming glow on the whitewashed forest, starkly framed against the black sky. Trees wore new snow like children in oversized dresses, bewildered by the heavy formality of winter. 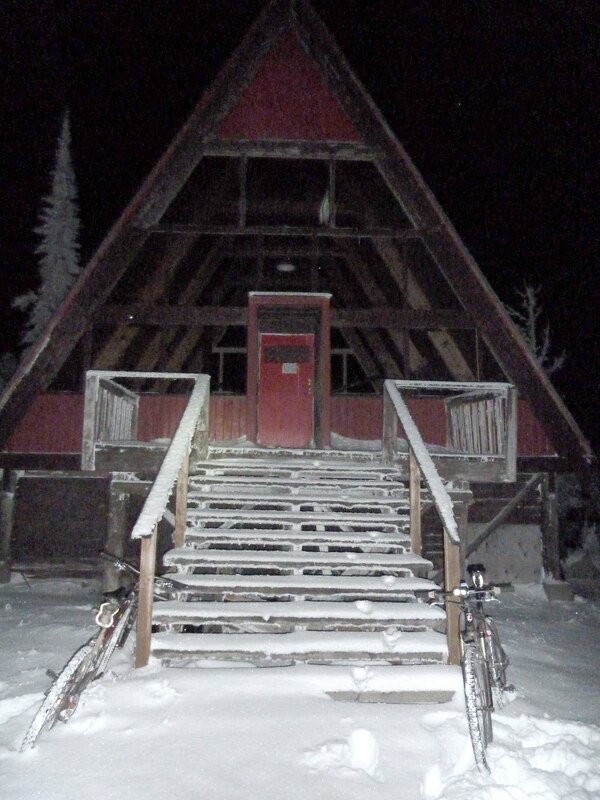 I clenched my numb fingers inside my mittens and pressed my palms against the handlebars. A fountain of fine powder streamed from Bill's rear wheel. I shifted my shoulders in an attempt to follow his line. Once powder is six inches deep or more, you don't so much ride a bike as surf with it, feathering the handlebars and gently shifting your weight as the wheels slice through the swift current. 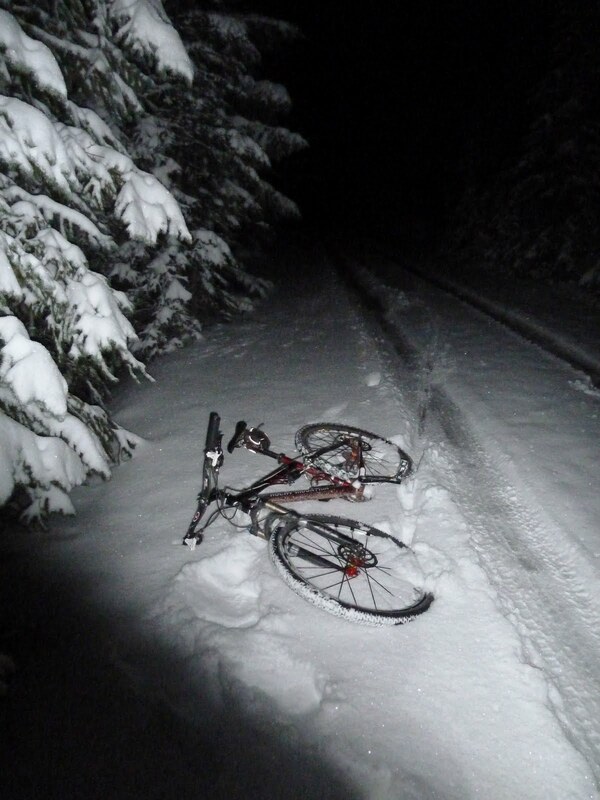 The rear wheel was swept sideways and my mountain bike fishtailed wildly through the snow. I pressed the brakes and righted it, then veered away from Bill, who was fishtailing himself. I blinked against the weight of ice frozen to my eyelashes. City lights sparkled in a distance far below. "What are you doing tonight?" Bill wrote to me eight hours earlier. "I brought my mountain bike to work, so probably a bike ride," I wrote back. "I don't know. I kind of want to ride to the snow." 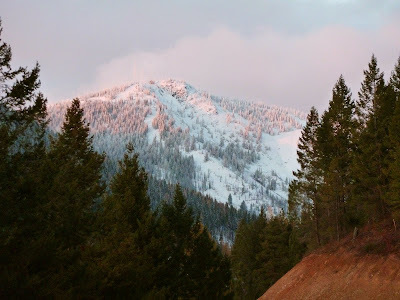 Snow had fallen in the mountains just outside Missoula over the weekend. It was the first significant snow cover of the year, and snow line looked like it was up around 5,500 feet. I was trying to think of how I could access it the fastest when Bill sent me a list of possibilities. And for some strange reason, I read through them and picked the destination that was both the longest and highest of all. Bill met me at my office at 5:20. Our pace was too fast right off the bat. Whenever I feel cruddy while riding with others, I'm never sure if they're pushing it more than we usually do together, or if I'm just having a bad day. Either way, my heart rate was severely elevated and I was breathing hard enough I had to deliberately enunciate each word in response to Bill's questions. We veered up Grant Creek canyon and my responses nearly trickled out altogether. The larch trees were in the peak of fall splendor - golden towers tinted with scarlet light at sunset. My throat started to burn from breathing excessive quantities of cool air. Bill let up on his pace a bit when I stopped chasing him. More than an hour and 15 miles had passed and we still hadn't reached the base of Snowbowl. My mind still hadn't registered that this was likely going to turn into a long ride. But it was one of those evenings where time didn't really matter. The crisp air, the color, the sunlight - it was all so idyllic that nothing else really mattered. The pressures of our day-to-day lives and our routines and our obligations didn't matter. Even the fact that my body was feeling cruddy and I was perhaps riding too hard didn't matter. 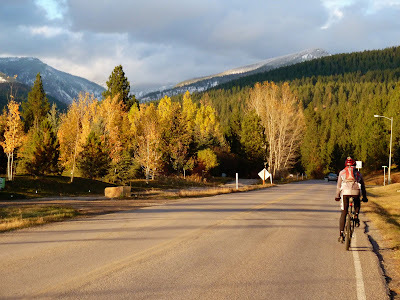 Bill and I rode toward the alpenglow and the one thing that did matter in that moment - the mountains with their inaugural snowfall, and the white silent world we were seeking. We climbed and climbed. The dirt road turned to mud, and then frozen mud, and then ice. 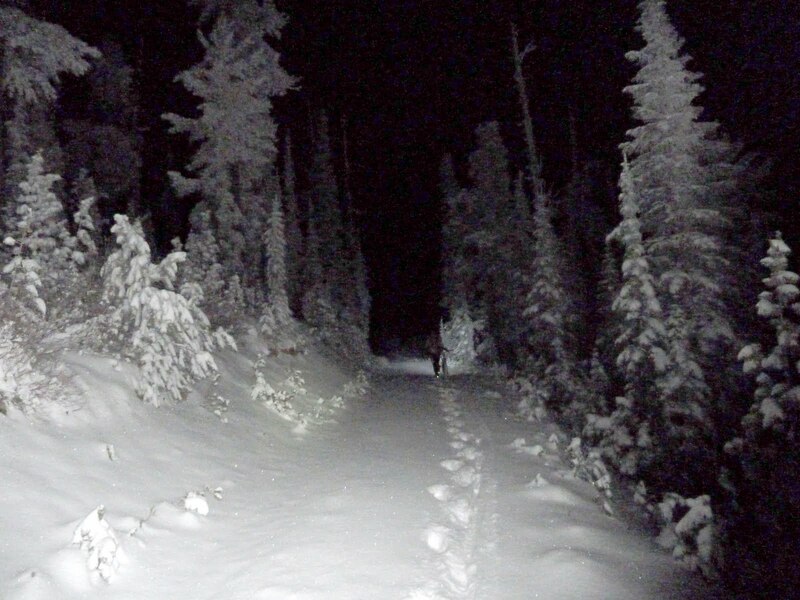 The first dusting of snow came into the beam of our headlamps. Then the snow grew deeper, the forest more saturated, until we found ourselves in a frozen world entirely different from the city's bright autumn hues. Bill watched his thermometer and announced the status of the rapidly plummeting temperature. "28 degrees ... 27 ... 26." Because I had come straight from work, and didn't anticipate riding in temperatures lower than the mid- to high-30s when I left in the morning, I didn't have all the gear I normally would for temperatures in the 20s. I was a bit underdressed, especially on my feet, so I occasionally jumped off the bike to run beside it. I ran until my throat burned, then jumped back on until my toes tingled. When I became too exhausted to run, I just walked, but by then the snow was so thick that I could easily keep up with Bill, even as he pedaled and I pushed. The snow started to become too deep to ride at all. Our wildly ambitious destination, Point 6, still loomed 1,000 feet above us. It was late. 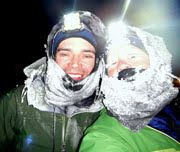 We were both cold, shedding heat and dreading the descent as it was. 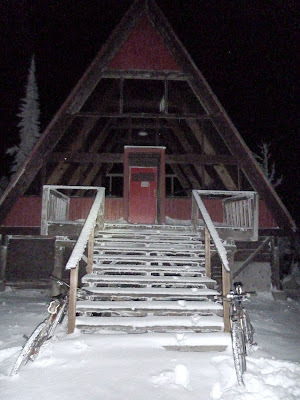 We pulled off at the top of Snowbowl - the ski resort we had been riding the perimeter of - and pushed toward an A-frame on the tenuous hope that the door would be unlocked. It was. We ducked inside and put on our remaining layers. It was time to stop seeking the snow, and start facing it. 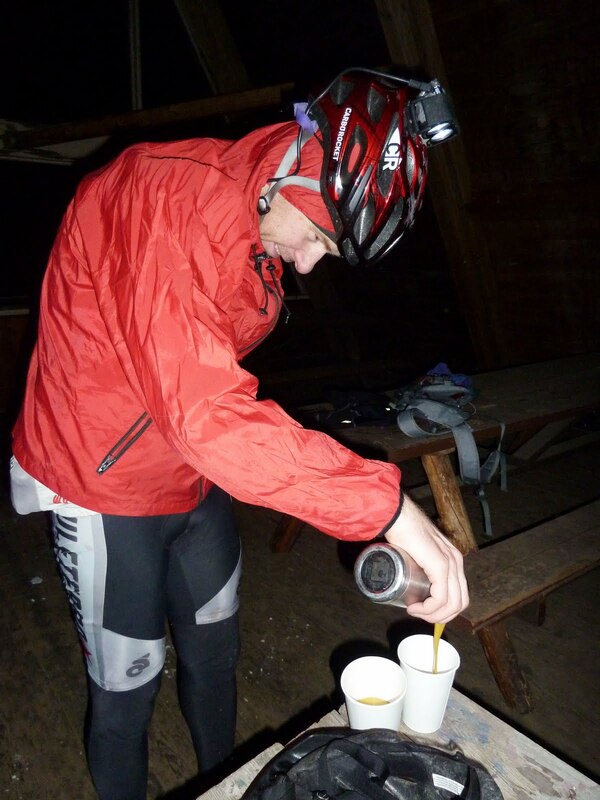 Before we left, Bill pulled out his special surprise - curry lentil soup in a thermos. It was halfway cold - a result of a ride that ended up being much colder and longer than planned. Bill's thermometer read 21 degrees. There was more frost than snow on the windblown building. I sucked at my Camelbak hose, but it had long since frozen solid. "Let's do this thing," I said. We surfed the steep downhill powder and picked up speed in a single truck track pressed into the road. The wind hit my face like sharp ice so I pulled up my face mask, which quickly started to fill with ice. 21 degrees with a 20 mph windchill equals a stinging slap of reality this early in the season. 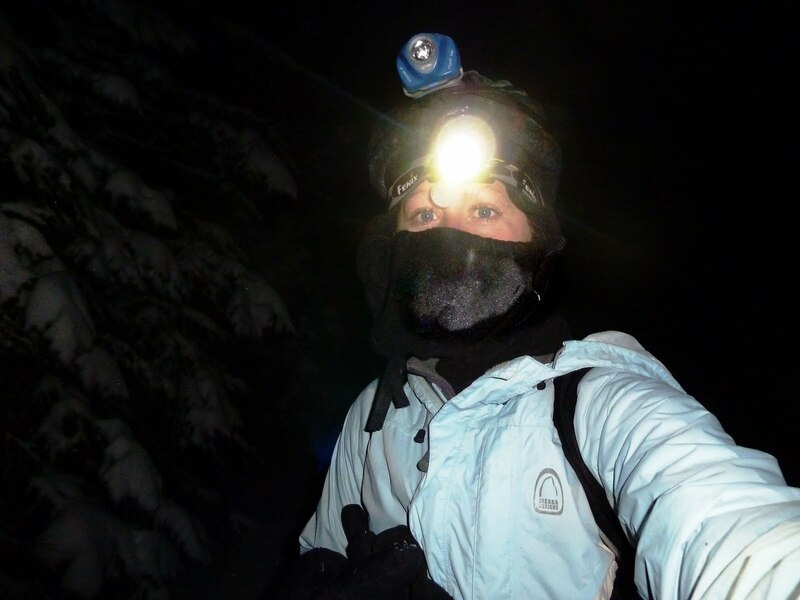 Eventually bodies acclimate and winter gear is figured out all over again and the biting edge of winter finally dulls. 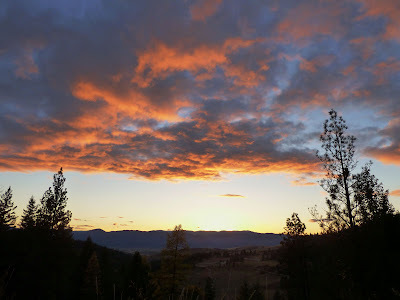 But right at the beginning, the cold is as sharp and forceful as a razor blade, and Bill and I cried out with equal amounts of exhilaration and pain, right at that center point where bodies feel the entire scope of what it is to be alive. More strategic running got us back to town with hands, torsos and feet that had reached a workable equilibrium. I felt more tired than I had after a post-work ride in a long time, so I asked Bill what the numbers were. 45 miles. 4,524 feet of climbing. Max elevation 6,933 feet. Time 5:35. Moving time 4:51. But GPS knew nothing of the high-friction snow, of the battles with the cold, of the silence and beauty and peace. That's because GPS isn't alive, and we are, which is why we seek these high places, steeped in the wonder of life. What a ride! I can understand that you felt tired after it. ;o) Great pictures btw. Qu'elle volonté et courage!!! vous êtes formidable. Merci pour ce partage. 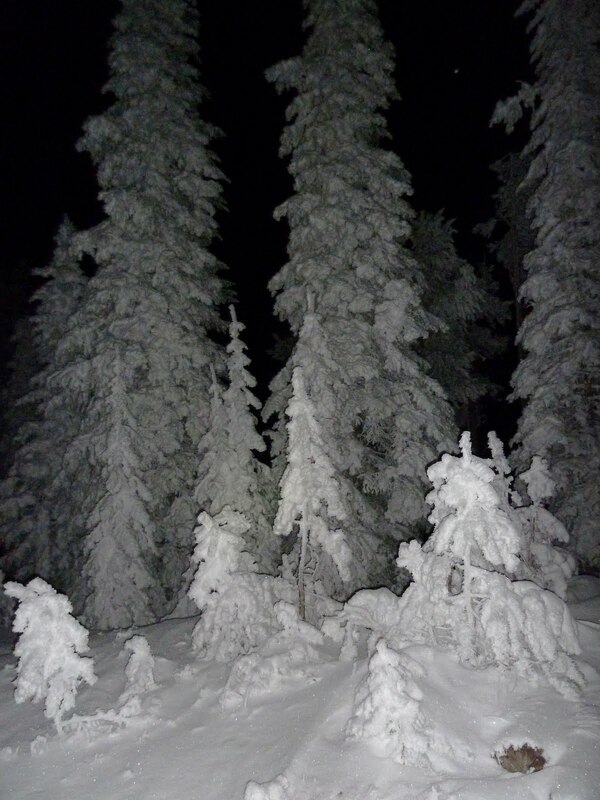 Trees wore new snow like children in oversized dresses, bewildered by the heavy formality of winter. That is a fantastic line. Great ride! 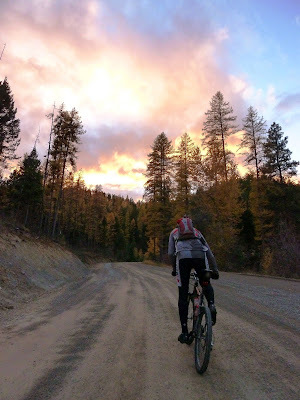 If I ever get myself back onto my bike, your posts are going to keep me there this winter instead of bagging it until spring. I can't imagine working all day then having the energy to pull off a tough 5 hour ride....very impressive! Great story and pics. What a killer after work ride! Bikes are truly the tools of adventure - no? You, Jill, are one cooool bird. Love it!! wow! that's a perfect place. Jill, you can't begin to imagine the enjoyment this blog has brought to me in both pictures and words - I live where the seasons are only summer and winter and the one high point locally is a 'massive' 2000ft. I totally agree with everyones comments above! Thanks again for bringing your world into my home. That is an insane ride if you ask me;) Great pictures! That's an impressive after work adventure. The photo of Bill pedaling toward the fiery sky is very cool.